We often get asked what the difference is between regular/fitness (mat) Pilates classes and our Clinical Pilates consultations. And it’s no wonder, the word ‘Pilates’ has become used by so many different businesses, each with varying degrees of quality. 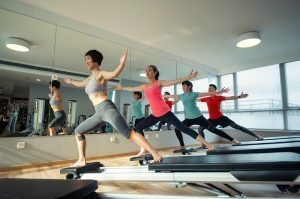 We have seen Pilates classes with mass fitness reformers in gyms, mats on the floors of workplaces or community centers and personal training centers as well as studios like ours with equipment such as Trapeze, Reformers, Wobble Board, Thoracic Barrel and Foam Wedge! But what does all of this mean and how do you know which type of class is best for you? You can choose either private or small group classes (up to 4 people), six days per week. We use the latest Clinical Pilates equipment, such as trapeze and reformers in our spacious Nedlands studio. Book your Clinical Pilates Initial Assessment now or call (08) 6389 2947.